IRMA 2019: IRMA is an Acronym for Institute of Rural Management Anand. It conducts the IRMA MBA Entrance Exam each year for providing admission to eligible and interested candidates to pursue their management studies from IRMA. Important Update: Don’t forget to Fill IRMA 2019 Application form Before 11:59 PM on 31 Dec. Late Submission is Not Allowed, so hurry up!!!! 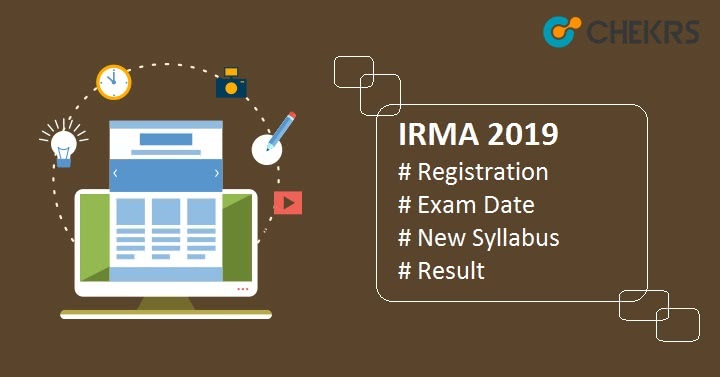 Update 17 Sept.: IRMA 2019 Registration / Application Form Filling process Started from today!! The IRMA MBA Admission Test will be conducted in February 2019. The candidates who qualify the IRMA Cutoff, they will be called from IRMA Counselling and then they will be allotted the seats as per their rank and the availability of seats. For candidates applying through CAT/XAT/GMA, Issues of Social Concern IRMASAT is mandatory. For PGDRM and FPRM the Eligibility criteria are different. We are providing IRMA Eligibility Criteria for both. Indian candidates, as well as the Foreign Nationals/PIO/Children of Indian workers in Gulf Countries and sons and daughters of NRIs, are also eligible. Must hold a Bachelors Degree in any Discipline with a minimum of 15 years of education. Having at least 50% aggregate marks at the Degree level. 45% in case of SC/ST/DAP. Only Indian Nationals can apply for FPRM and satisfying one of them. Post-graduation from any recognized University or Institution with 55% marks at PG and 50% marks at Graduation (college) level. For SC/ ST/ OBC/ differently abled person 5% less marks required. Five-year professional degree in one out of medicine, veterinary Science, architecture etc. with minimum of 60% marks + one-year work experience. For SC/ ST/ OBC/ differently abled person 5% less marks required. Four-year professional degree in one out of engineering, agricultural Sciences etc. with minimum of 60% marks + at least three years of work experience. For SC/ ST/ OBC/ differently abled person 5% less marks required. UGC JRF is mandatory, the only NET is not sufficient for getting an exemption from the admissions test. The IRMA MBA Admission Test 2019 will be normally conducted in the month of February 2019. All the Events will happen in the same date period compared to the last year’s exam. So We are providing tentative IRMA 2019 Dates Here. The IRMA Registration form is expected to be announced in the month of October 2018. It will be available through online and offline modes. The IRMA 2019 Application Form will be available till 3rd week of January 2019 for Indian Candidates and till March 2019 for the Foreign Nationals. In online mode, candidates have to visit the official website and do the IRMA Registration using Email and Password. Now Login and Fill all the asked details correctly in the application form. Upload all the required Scanned images and documents. At last, pay the fee and submit the application form. In Offline Mode candidates have to purchase the Application form through IRMA Admission Office. They can do this by writing to the following address with a DD in the favor of the “Institute of Rural Management Anand”. The authority will send the printed prospectus, application form, Sample Question Paper of IRMA SAT etc. Candidates from BPL category also have to send self-attested latest proof of BPL status. The IRMA 2019 Application Fee can be paid in Offline and Online mode. In Online mode, candidates can pay using Credit/ Debit card and net banking. In Offline mode, candidate can pay using Bank Challan of SBI Bank. After Filling the application form start your Preparation for the IRMA Entrance exam using the IRMA 2019. IRMA SAT will be conducted for students applying through CAT/XAT/GMAT. IRMA Syllabus will consists of four Sections i.e. Issues of Social Concern, English Comprehension, Analytical Reasoning, Quantitative Ability. The Admit Card will be released Online on the official website only. Candidates have to download it from the official website. Candidates need to carry the Admit card with one Photo Id to the examination center. The admit card will be available in the last week of January or First week of February or three days before the exam. Candidates have to Visit the official website and then find the link on download IRMA Hall Ticket, Enter your Registration number. And download and print the IRMA Admit Card. IRMA Final Result will be released in the 2nd week of March 2019 for Indian Candidates and in 1st week of May for 2019 for foreign candidates. In Result, Candidates will get sectional and overall scores. Candidates can download the scorecard from the official website. The IRMA Cutoff will be declared soon after the declaration of result. overall and sectional cut off marks both are important. We are providing the expected cut-off of IRMA 2019. On the basis of weightage of these stages/ Round, the Final merit list will be prepared and admission will be provided to the qualified candidates.